‘Tis the season for family and friend gatherings, winter weather and proper floor care and maintenance. As the holidays and winter approach, maintaining your hardwood or bamboo floor is essential. 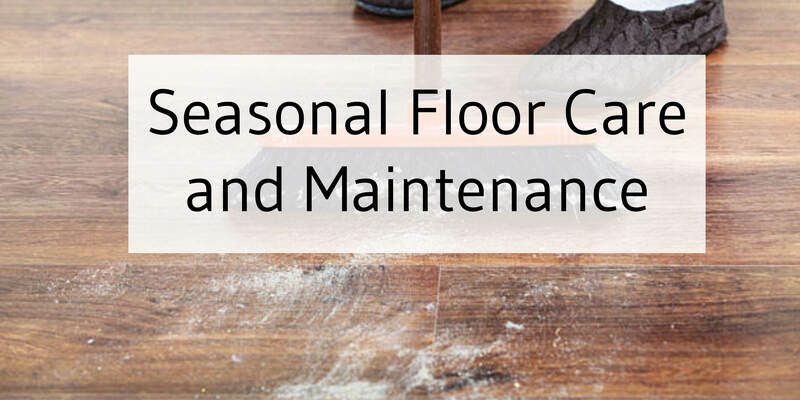 Prepare for moisture, salt, decorations and extra shoes now to keep your floor looking beautiful longer! When the snow starts falling or lots of guests come in your home, extra mats are essential. Place mats by entryways for shoes as well as wet coats. Mats will help prevent moisture from sitting on your hardwood or bamboo floor, as well as keep debris like ice and salt off your floor to ruin the finish or leave a stain. Clean your mats frequently, as well as under the mats to make sure no liquid or debris is trapped underneath. One thing people often forget is to protect their floor from is their Christmas tree! Tree skirts are fun and decorative, but a tree mat will work better. An extra mat under your tree stand will help keep tree sap and pine needles from covering and potentially damaging your hardwood. Don’t clean harder, clean smarter in the winter. Salt and ice melt are stronger than your everyday dirt and debris, so your everyday hardwood and bamboo floor cleaners won’t be as effective. Look for a winter floor neutralizing solution to remove salt and ice melt. Always be sure to read the cleaner’s instructions and test in an inconspicuous area. Tesoro Woods recommends Bona PowerPlus Deep Clean for our hardwood floors in the winter. In most areas of the country the air becomes dryer in the winter months. Many forced air heating systems can dry the air even more. Heating and maintaining humidity evenly is key to extending the life of your floor. Moisture will cause your flooring to expand while dry air will make your flooring contract. Remember, wood and bamboo are natural products, so it will happen if humidity levels in your home aren’t controlled. Using whole home humidifiers will help control your home’s humidity level. These can be room size models or installed as part of your forced air heating system. Contact an HVAC professional to recommend the appropriate one for your system. An ideal humidity level should be between 40% to 60%. Like mats, rugs will help limit foot traffic directly on your floor and help decorate your home. No floor is “scratch-proof”, so when guests arrive for the holiday, rugs can limit damage to your floor from shoes and debris, and they make your home feel cozy. Shop FloorsUSA and Hagopian online, they are authorized Tesoro Woods dealers who sell rugs across the country. If you’re getting a rug for your floor, get a felt rug pad with a rubberized back as well. The pad will provide some added cushion to absorb the impact from traffic, extend the life of your rug and prevent damage to your floor. Just be sure to clean and dry your rugs regularly to remove all winter debris like salt and ice. We all know that moisture on wood floors should be avoided. Excess moisture can warp floors and cause gaps between floor boards, so be prepared to wipe them up as soon as possible. Have towels or a dry mop ready to clean any drips or melted ice. Shoe mats will help collect any moisture, keeping it off of your floor, but always be prepared for those little puddles when the temperature drops. Keep in mind that any pets that go in and out of your home can track in extra moisture too. Always dry off paws and fur before they drip all over your hardwood or bamboo floor. A towel, mat, rug or dry mop by the back door is always a good idea! More care and maintenance information for Tesoro Woods’ floors is available here. As long as you take care of your floor in the winter months, it will look beautiful for years to come!